﻿ Amrap's AirIt | Australian Music Radio Airplay Project :: Classical :: Ruth Roshan & Tango Noir - Darling....Keep it To Yourself. Amrap's AirIt | Australian Music Radio Airplay Project :: Classical :: Ruth Roshan & Tango Noir - Darling....Keep it To Yourself. 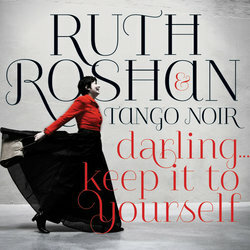 Ruth Roshan & Tango Noir - Darling....Keep it To Yourself. Ruth Roshan is a vocalist, songwriter, arranger and classical mandolinist. Using the rhythms of popular in 1920s cabaret, the Tango, the Habanera, and the Waltz, she evokes the atmosphere of that era. Silent movies, in black and white, with smoke drifting across couples embracing to the Tango - this is the musical scene that Ruth paints with her music. A song of defiance, set to a dramatic Tango rhythm. Taken From The Release Titled Darling..keep it to yourself.